Trejdify Top Stories: Will the CKE Restaurants shares be as popular as their hamburgers? Will the CKE Restaurants shares be as popular as their hamburgers? To analyze this company, we are going to use the same method used by the famous fund manager Peter Lynch. Using "Common Sense" can summarize the method. For example, if you like to buy Apple products, you should also take a look at the Apple stock. If you would like to learn more about the methods used by Peter Lynch, you can read this summary: Peter Lynch - Beat the stock market with what you already know, or invest in the excellent book One up on Wall Street written by Peter Lynch himself. The Facebook stock ($FB) was the hottest IPO this year, and the performance of the Facebook stock after the IPO shows exactly why it is a good idea to avoid the hottest IPOs. The Facebook stock used to trade at $45, and is now hovering at around $20. 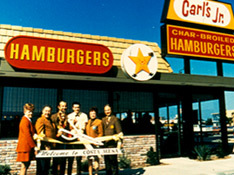 One less hot IPO is that of the company CKE Restaurants ($CK), which will begin trading at August 10, 2012. The IPO has been postponed due to poor market conditions. The first step when analyzing a company selling food is always to eat the food and see if you like it. Peter Lynch always loved that he could buy stocks in a company where he liked to eat the product. This may be a problem here, CKE Restaurants will soon open a Carl's Jr in Sweden, but you can't find one here today. So, the proper way to analyze the company if you can't test the product is to search the social media, and try to see what people are writing about the product. We are going to use Twitter here, just type in the company name in Twitter Search and go though the tweets. I want Carl's Jr right now. I searched through a couple of hundred tweets, and the only somewhat negative tweets I found were about people complaining about why Carl's Jr restaurants are expensive. The growth here is defined as the growth in the amount of restaurants. 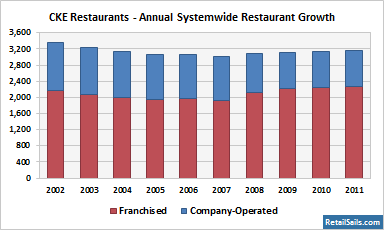 From the image below, we can see that the growth in the amount of restaurants has not been that good. 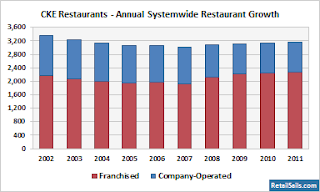 According to Peter Lynch, CKE Restaurants is probably a Slow Grower. They currently have 3263 restaurants in 26 countries. Peter Lynch has a list with the attributes of a great company to invest in, here are the attributes that fit CKE Restaurants. The customers like the food, but the company's numbers don't show that. The same-store sales has been negative the last 2 years, and the change in revenue has been negative the last 4 years (-0.5 percent to -6.2 percent). People complained on Twitter that it's expensive to eat at the restaurants, but the food is more tasty compared with less expensive restaurant chains like McDonald's. Since the economy is still in a bad shape, maybe people prefer the less expensive and less tasty burgers? Remember that this was only a short introduction to to the company to use if you haven't heard about the company before, and to get a feeling if you would like to learn more about the company on your own.